Mountain biking, like any other sport, has a specific set of core skills which are not inherent. You can only become a faster rider on technical terrain once you understand the specific cues that allow you to ride smoother over rocks and roots, safer over jumps and drops, faster around berms, and tackle steep sketchy terrain. These core skills are not intuitive and not learned from experience. Rather, it needs to be learned through skills drills followed by regular practice to reach your potential. During our workshop we make sure to provide you with the tools you need to improve your mental and physical side of mountain biking. SKILLS LEVEL: This is for you if you are new to mountain biking. 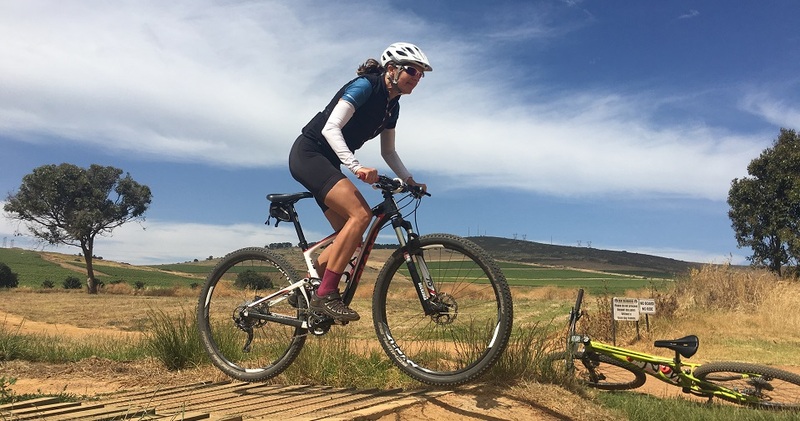 You are comfortable riding very easy single trail and gravel roads but you don’t know how to handle corners and any obstacle in the way. WHAT’s INCLUDED: Qualified skills coaching, nutrition talk, ride specific strength training, bike set up tips, basic mechanical support, goody bag, permit, coffee/tea, light lunch, Hammer Nutrition and more. Workshop is held by Hannele Steyn, Kate Slegrova and Katja Steenkamp. SKILLS LEVEL: This is for you if you have been riding for more than a year. You are confident on most trails but still nervous in root and rock gardens, smaller drops, switchbacks and berms. Entries are open now and close 22 April. Note that we have limited space, so secure your spot soonest and be sure to come out as a more confident and skilled rider! If you are not satisfied with our workshop we will reimburse your entry fee! Send your questions to katja@breakawayrides.com.